Quinoa Dosa is a crispy, delightful version of fusion dosa you can make. In this version, quinoa is ground along with rice and urad dal as regular batter and turns out excellent. I have been having Multi Colored Quinoa seeds lying in my fridge for over 2 years now. I must say it’s a seriously case of shelf life testing! Priya Srinivasan sent me a packet as I wanted to use it and the locally available produce is so expensive. She had sent lot more interesting flours and I have been saving it up to land on the perfect dish to experiment. Finally I had to discard few, used few. I felt so terrible at wasting and was so upset about it. 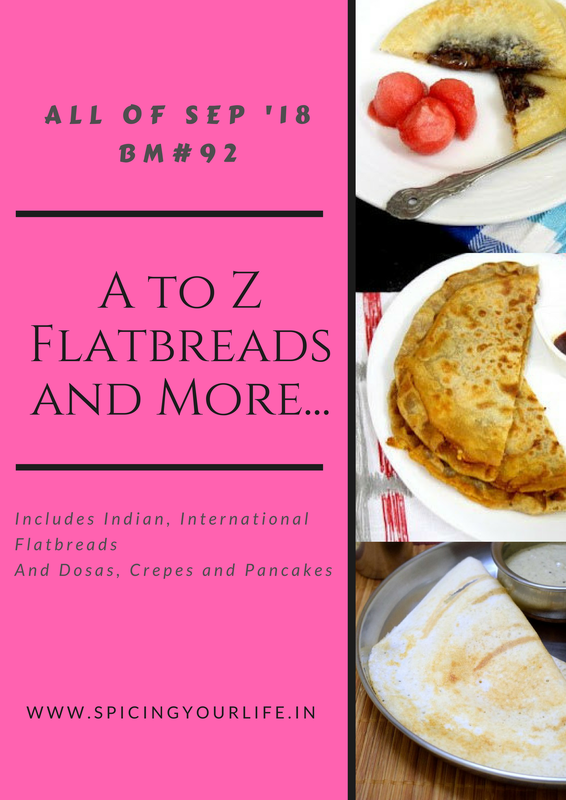 I profusely apologized for my overlook and was so glad that I finally was able to use these seeds for this alphabet in Dosa Varieties. I was little skeptical about the taste and how my folks will like it. Surprisingly the dosa turned out so good, very crispy and tasty too. Hubby dear said I can make this to complete the packet. So this is something that will surely be repeated at home. I am hoping my kids will like it too. I was so glad that I got a proper dish for this tough letter and so it is Quinoa for Q in the AtoZ Flatbread and More, where I am doing AtoZ Dosa Varieties. Wash and soak the quinoa along with rice, urad dal for at least 8 hours. When you are ready to grind, drain the grains and grind with just enough water to a smooth batter. Add salt and mix well before fermenting for at least 8+ hours or overnight. When you are ready to make the batter, stir the batter well. Grease a nonstick pan and pour a ladleful of batter, spread in a circular motion as you regularly make. Drizzle oil/ghee and cook on low flame. Flip to the other side and cook for few seconds. The quinoa dosas turn out very crispy and thin. Since I was soaking multiple dishes, I soaked the rice, urad dal and quinoa separately. Ground and fermented on its own. I soaked it on Saturday morning, ground it to smooth batter by sat evening. Refrigerated right way and kept it out to ferment from 5 pm as I planned it for Sunday dinner. The dosas came out very perfect. Since I was soaking multiple dishes, I soaked the rice, urad dal and quinoa separately. Ground and fermented on its own. I soaked it on Saturday morning, ground it to smooth batter by sat evening. Refrigerated right way and kept it out to ferment from 5 pm as I planned it for Sunday dinner. The dosas came out very perfect. Wow ! The quinoa Dosa looks so nice and crisp , perfect for anytime ! Would love to try some of this healthy and innovative dosa . Tell me about ingredients in the fridge…I keep planning and planning. So glad you used tri colour quinoa in such a delightful dosai. Looks so crisp and delicious! Yes even the regular quinoa can be used the same way. Multicolour quinoa makes this dosas more catchy and those dosas ressembles as much as like ragi dosa. How crispy those dosas looks. I would love to have few dosas with some onion chutney rite now. Hahaha, I can totally relate to this Valli. I still have Zaatar Priya gave us. But I have saved it for those interesting recipes and have been using it sparingly. This version of quinoa dosa looks fabulous. Very crispy and with a spicy chutney, it would be delicious..
An interesting and different way to use quinoa. I love quinoa so making these dosas will be no problem. Quinoa dosa looks so crispy, a very good recipe to use quinoa in. So true at times we save things thinking we will use it for something very nice as it is too precious and then unfortunately we have to discard it, good that you had a good use of this. But wait did u mention multi colour quinoa, never heard of it. Quinoa is perfect pick for Q letter… perfect recipe for gluten free diet ppl. Dosai is a great recipe to use Quinoa. My husband does not like quinoa much and this is the only recipe he does not mind with quinoa. The dosa has come out very crispy Valli! Wow! Multicolored Quinoa! Now I have to look for someone to bring me some!! And yes, all the stuffs that our friends get us is stored safely in the fridge / freezer waiting for the perfect dish to experiment with. I even have some from BM 25th meet! !And this is an interesting dosa with Quinoa!